The Kalamazoo River system drains an area of approximately 2,020 square miles as it flows through portions of the southwest Michigan counties of Allegan, Barry, Eaton, Van Buren, Kalamazoo, Calhoun, Jackson, Hillsdale, Kent and Ottawa. 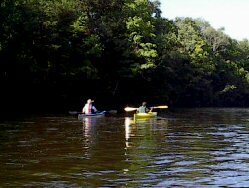 The Kalamazoo River has no white water, making it a canoe outing that everyone can enjoy. It passes through the Allegan State Forest, a wilderness area little changes since the days when the Ottawa, Potawatomi and Chippewa Indians used it for transportation. It allows for a leisurely on a mild current. Sorry, we have not listings in this category at this time.